Watch our new videos on You Tube! 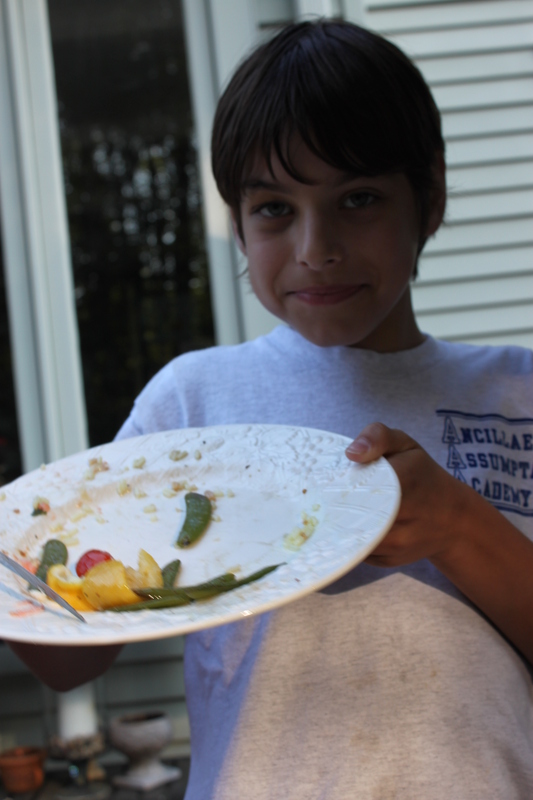 It is so rare that I get to spend a quiet dinner at home with just me and……my 10 yr. old son. This being a rare occasion, I asked him what he would like to have for dinner (sushi is out because he gave up raw fish for lent). He asked for fish, cooked. So we stopped at the fish market and I let him choose. “How about the Flounder, or the Cod?”, I suggested. He told me, “Mom, it’s important to mix it up a bit, how about the large red snapper?!”. Like I need a lecture on exposing kids to different foods, who’s teaching who here? Pat fish with paper towels to dry it and salt lightly. Grab a baking dish and lie fish skin side up. Mix 2 TBS of EVOO, juice from 2 lemons, 2 TBS of white wine, ½ TSP of Fine Herbs into a bowl (add 2 TBS of fresh parsley and 1 chopped clove of garlic if you have it). Pour it over the fish. 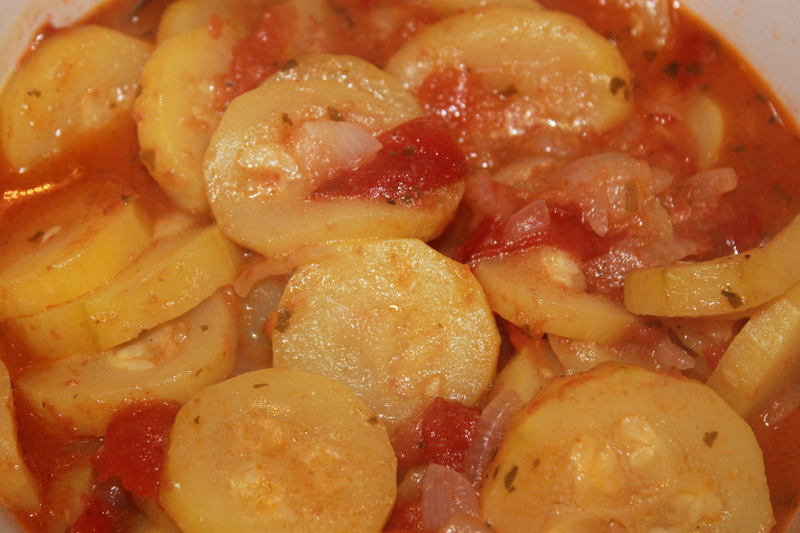 Slice ½ cup of grape tomatoes and lay them on top. Wash and trim stems. Heat 2 cloves of garlic in 1 TBS of EVOO for a minute or so. Stir fry brocollini with a dash of ginger powder and 1-2 TBS of soy sauce and a small dash of crushed red pepper. Cover and reduce heat for 1-2 minutes until cooked through. 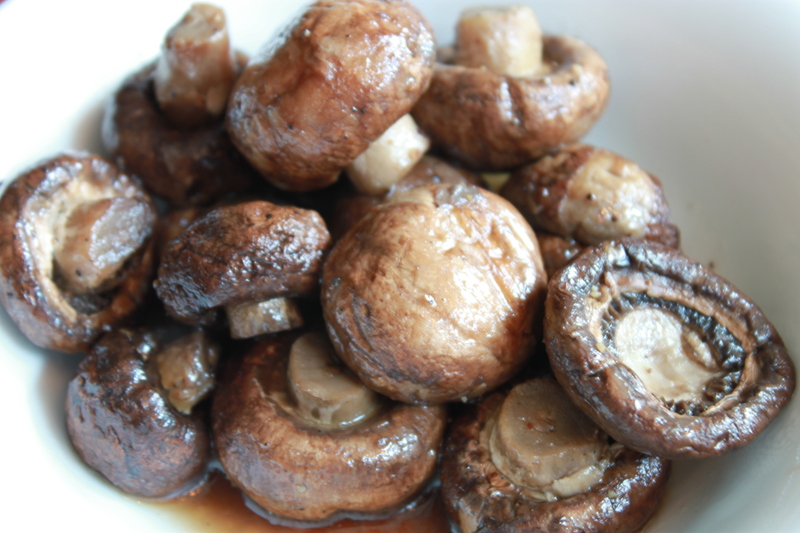 Cook ½ onion and some mushrooms in a drop of EVOO and cook until soft. Add 1 cup of cous cous and stir. Add salt, pepper, 2 TBS of parsley and 2 cups of chicken broth and/or water. The broth makes it a bit more starchy. You could even add some chicken and spinach to this recipe and make it a quick main course. 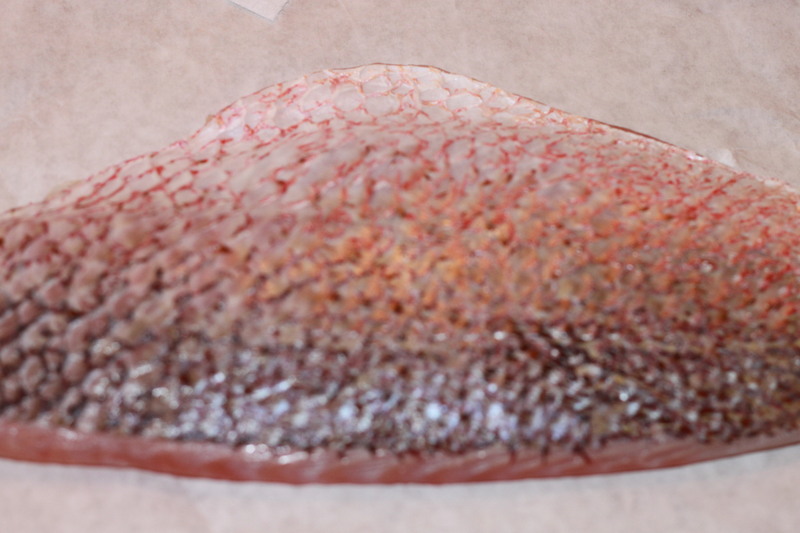 Did you know that Red Snapper is the most sought out fish in the Gulf of Mexico? 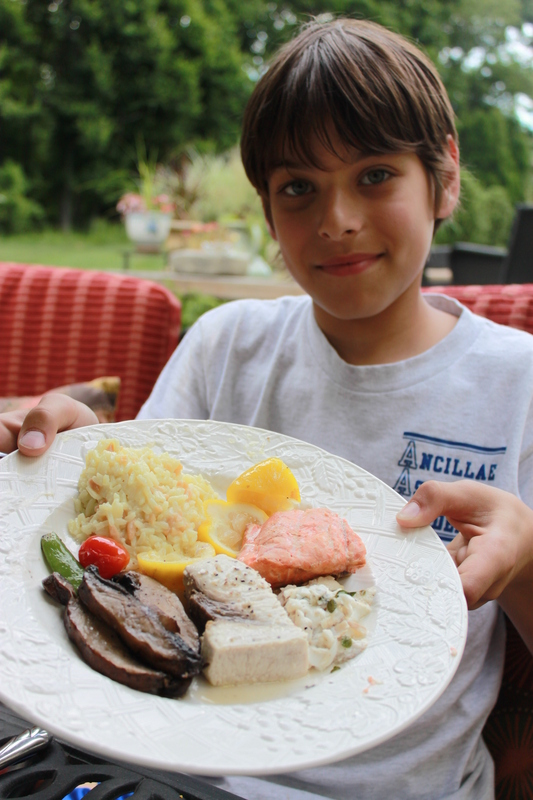 Last week my son was eating a piece of fish so simply grilled and prepared from Red Stone. He said “This is a piece of heaven. This is the future of food!”. How true that statement is. But what my son doesn’t know or remember is that food USED to be fresh and simply prepared years ago. In the days where everything is processed and doctored up in some way, we can only hope (in this case) that history does repeat itself. Just leave the ugly clothes and hair behind. Peel shrimp and dry them. Cook some GF cappellini in salted water and drain saving 1/2 cup of pasta water. Heat some garlic in a little olive oil and 2 TBS of butter. Cook shrimp for about 2 minutes on each side. Add a little salt/pepper and move shrimp to a side dish. Add lemon juice (1 lemon), 1/4 cup of fresh parsley, about 1/4 cup white wine to the pan and cook for about 5 minutes until it thickens a bit. Toss the shrimp and sauce over the pasta. Stir and serve adding additional pasta water as needed for sauce). Cut up some carrot, fennel, broccoli and brussel sprouts (cut in half). Toss in a baking dish with some EVOO and “Fine Herbs” (it’s a nice blend). Bake on 375 for about 40 minutes or until tender. 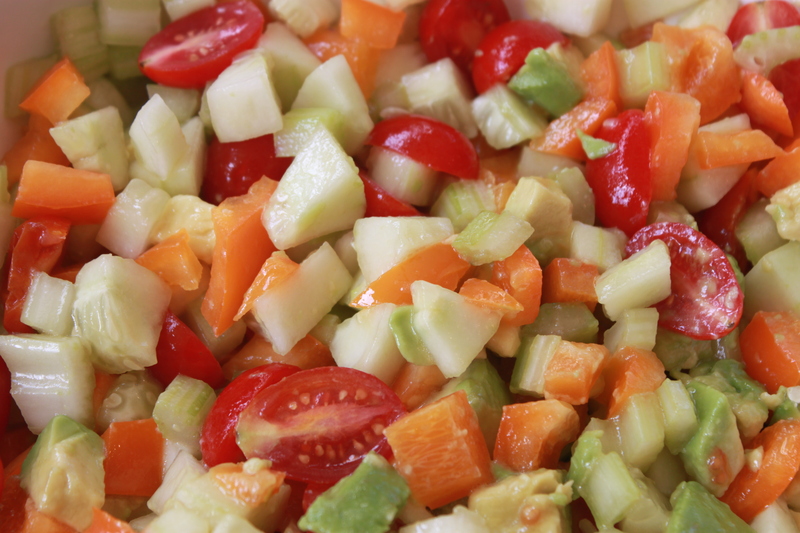 Make a salad and add some tomatoes, celery and whatever you have left from the week. Toss with some balsamic vinaigrette. I like to add a little fresh basil or a bit from the spice tube for added flavor. Teach them to “smash” the garlic and peel the skin off. Show them how to de-vein a shrimp. For years my mom made zucchini w/fresh tomatoes (we called it “gagoots”) and I never liked it. Tony Soprano used to call his stupid-head son “you big gagoots”. Hard to believe after 40 years that I am now making the exact same thing. Not only do I finally LOVE it, but my kids quickly started liking it too! I guess it’s true, we really do become our parents when we get old. I can only hope that my kids learn their life lessons as quickly as they learned to like gagootz. Salt and cut fish into several pieces (as desired). Dip into flour, then egg, then GF breadcrumbs. Use flounder or cod, whatever looks freshest. 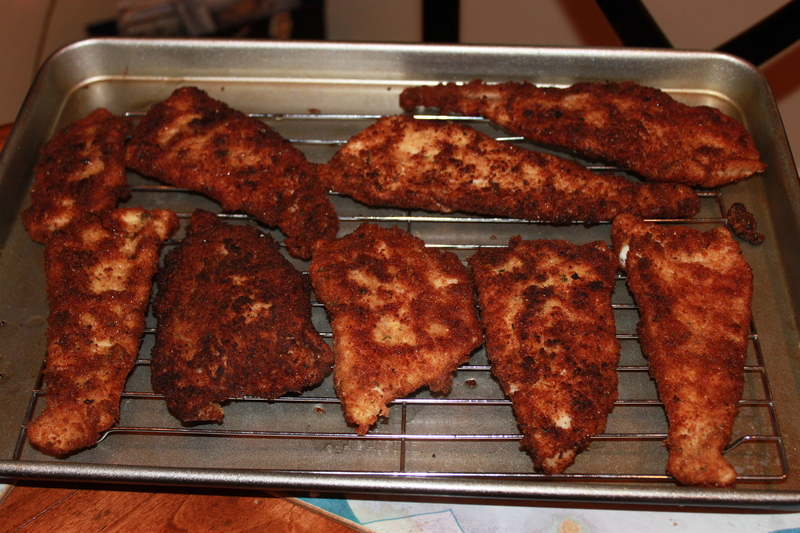 Fry in grapeseed or canola oil (enough to coat the pan well but not submerge fish). Flip it as soon as it’s brown. When the other side browns, immediately put on a baking rack to cool. Serve plain or with ketchup or tartar sauce. Heat a little garlic in about 2 TBS of EVOO in a pot. Add some sliced onion and cook until soft. Peel and slice 3-4 zucchini (about 1/2 inch thick circles). Cut 3-4 tomatoes and add with zucchini into the pot. Heat on Medium for about 15 minutes or until cooked. I am hooked on this Brown Rice cooked and frozen in a bag from Whole Foods. Just heat it up in the Microwave and add a little EVOO or soy sauce for flavor/texture. Great for a quick starch! Let the kids help crack the eggs and pour the breadcrumbs. Let them help with the dipping into the flour, etc. FYI: The dish “Gagoots” is a true italian term for a traditional dish that typically includes zucchini, onions and peppers. For goodness sake, no wonder everybody struggles with their weight. Have you been to the big grocery stores lately? The majority of food is processed and filled with chemicals that are known to cause serious harm to our bodies. Does a cigarette come with those pizza rolls? The reality is that cheap food is typically highly processed and faster to cook than fresh (if you don’t know better and haven’t read everydayfamilyfood.com of course). Would you go to the beach without sunscreen or worse yet, tan with baby oil (even your face)? Heck no! We all look back and can’t believe the damage we did to our skin years ago – but who knew any better? Ten years from now you will be just as horrified remembering a time when we ate 60 pounds of high fructose corn syrup per year and 40% of all foods in a grocery store had hydrogenated oils in them. 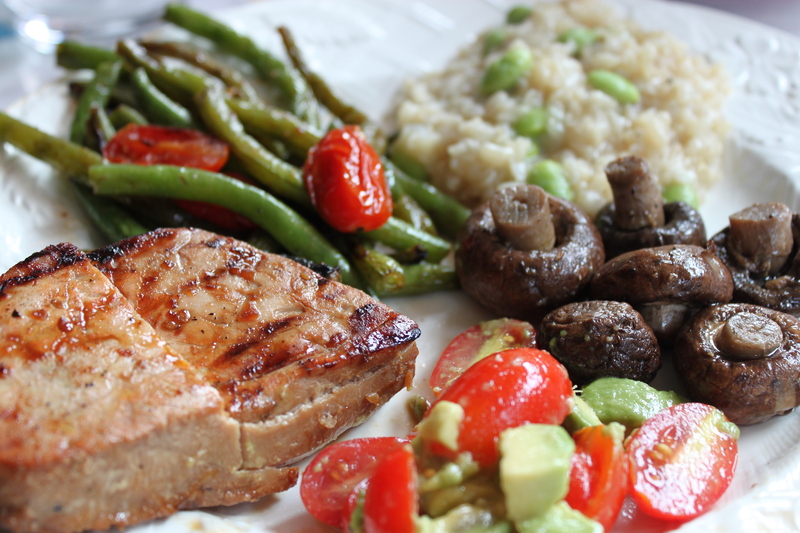 Grilled Tuna: This is a variation on the marinade I use for my flank steak recipe. 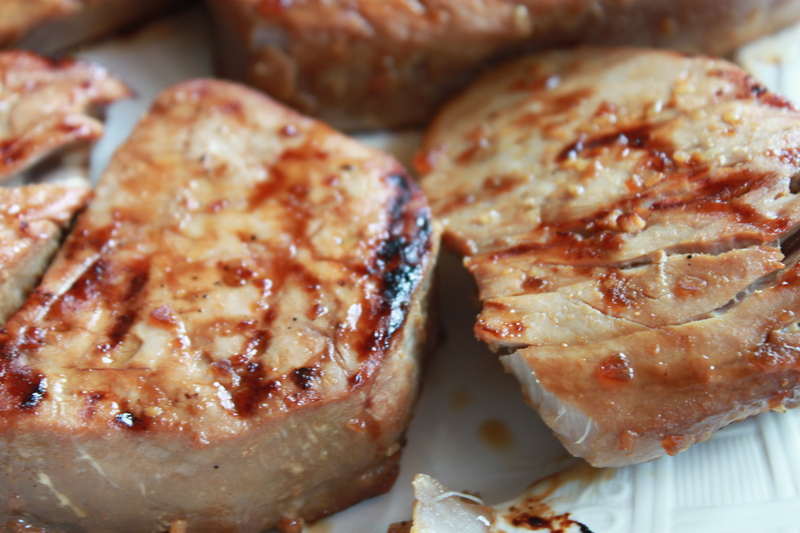 Take 4 fresh tuna steaks and marinate in a Ziploc for 10 mins. or 2 hours in the fridge. Marinade: ¼ cup of Soy sauce, 3 cloves of garlic, 3 TBS of brown sugar, ½ TSP of ginger. Add a chopped shallot if you have it. Grill on tin foil for 3-7 minutes on High. Flip and grill for another 3-7 minutes on Medium. Cook times vary based on how rare you like it cooked. 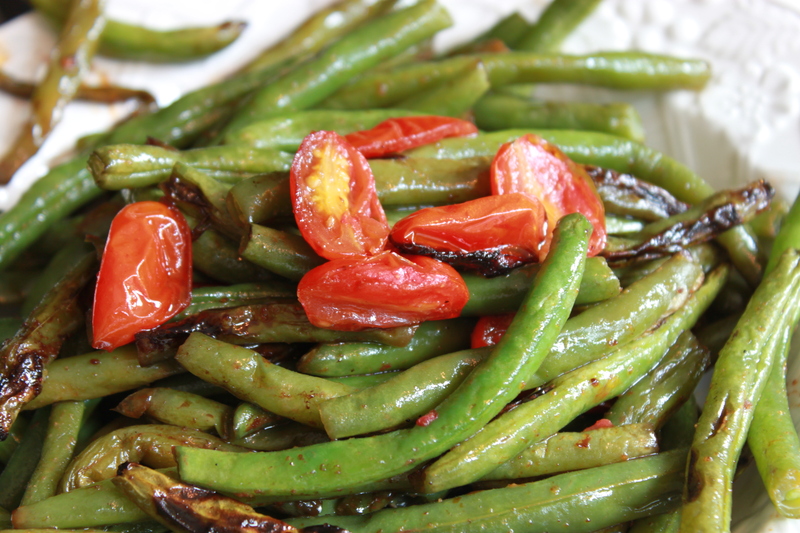 Wash and snip string bean ends (or defrost) and cut grape tomatoes in half. 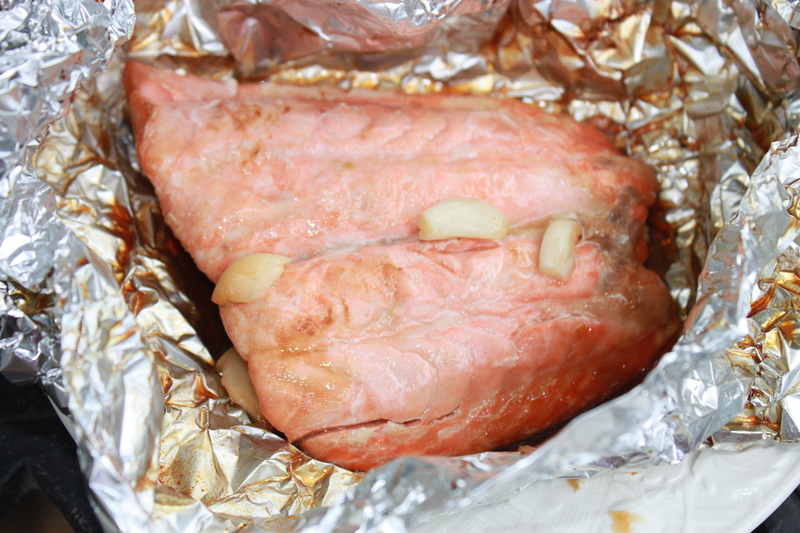 Grill for about 10 minutes – wrapped/covered in foil. Stir to avoid sticking/burning. Wash or wipe button mushroom clean. Toss with a drizzle of olive oil, kosher salt/pepper and grill on tin foil for about 10 minutes. 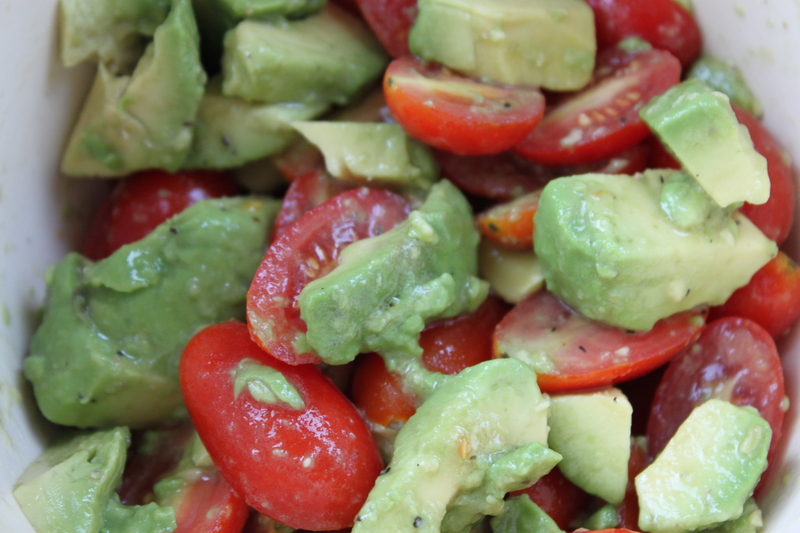 Cut one avocado into cubes and slice grape tomatoes in half. Toss with ½ fresh lime, olive oil, red wine vinegar and salt/pepper. Brown rice takes a while to cook so you can use instant (10 mins.) or buy it cooked and frozen from Trader Joes or just make a large batch and freeze it yourself. Cook/defrost rice. 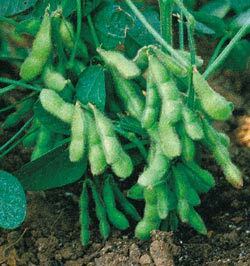 Add a drop of soy sauce and edamame and stir. You could also add some lemon zest and tarragon for a french vs. asian flare. 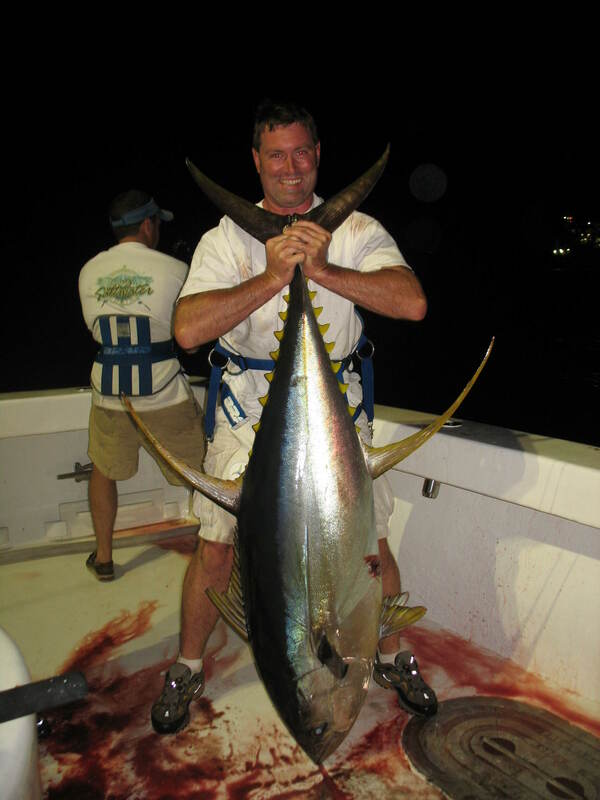 The consumption of canned tuna accounts for more Americans eating tuna than any other type of fish. Surprise – No Grill Gas! I smile and think, “who needs the grill tonight after all?”. 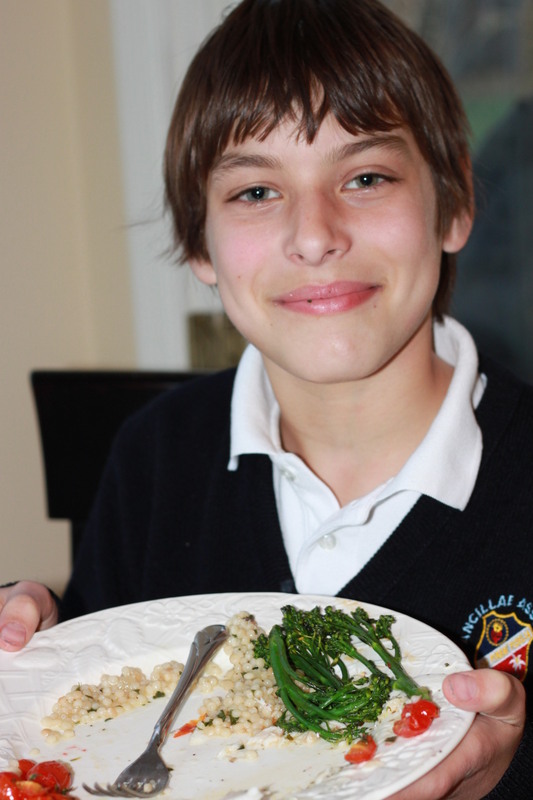 Broiled Flounder: Each piece of fish uses a separate piece of tin foil so mix up the toppings. 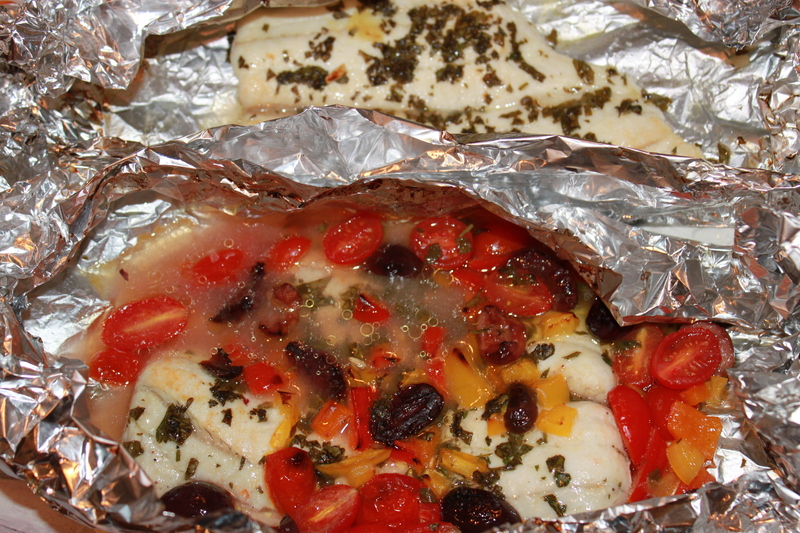 Lay a piece of flounder on tin foil and drizzle some EV olive oil on top/bottom. Flip the thin tail underneath so the fish is about the same thickness across). Chop some fresh herbs (or dried) basil, parsley and/or thyme – whatever you like. Squeeze some fresh (or bottled) lemon juice and a splash of white wine (if you have it). 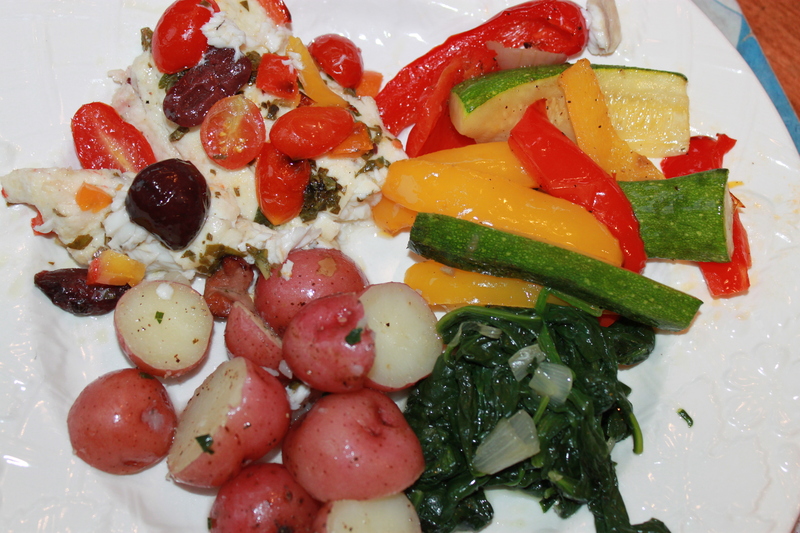 I added some leftover calamata olives and grape tomatoes to my 2nd piece of fish. Broil for about 10-15 minutes. Slice a zucchini (into spears), and some colored bell peppers and tossed with olive oil, shallots, salt/pepper on a piece of tin foil. Covered and poked holes and broiled for 10-15 minutes. Cook some shallots up in a little EV olive oil in a large pan. 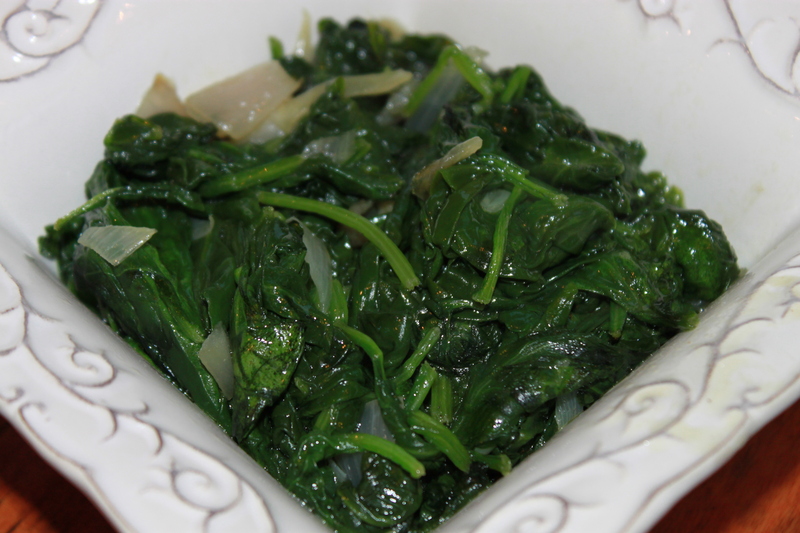 Add fresh spinach and toss w/ salt/pepper (add 1-2 TBS of water if needed). Cook for about 5 minutes. 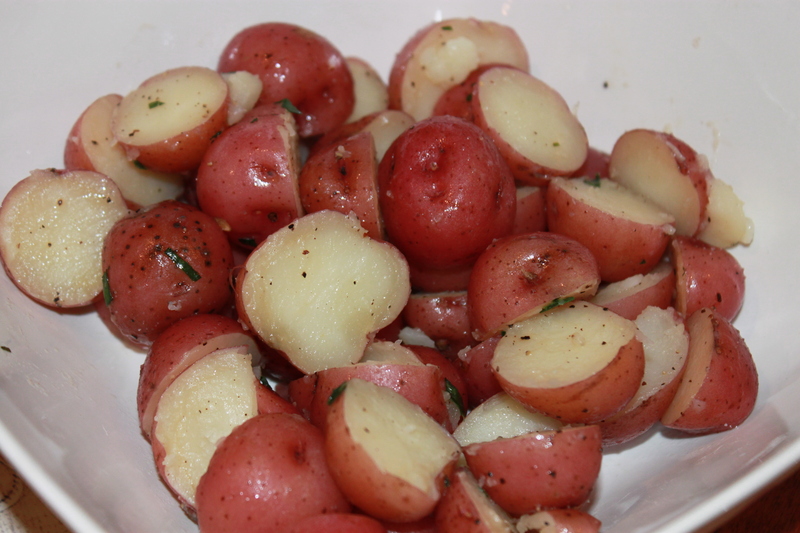 Wash and slice baby red potatoes in half. Boil for about 10-15 minutes. Toss with EV olive oil, salt/pepper and a little tarragon (fresh or dried). Pick the herbs for the fish. All you need is a pot to grow a few herbs for summer. Roll the lemon on the counter to loosen the juices. Squeeze lemon wedge onto fish and sprinkle chopped herbs. Taste the fresh (raw) veggies before cooking! 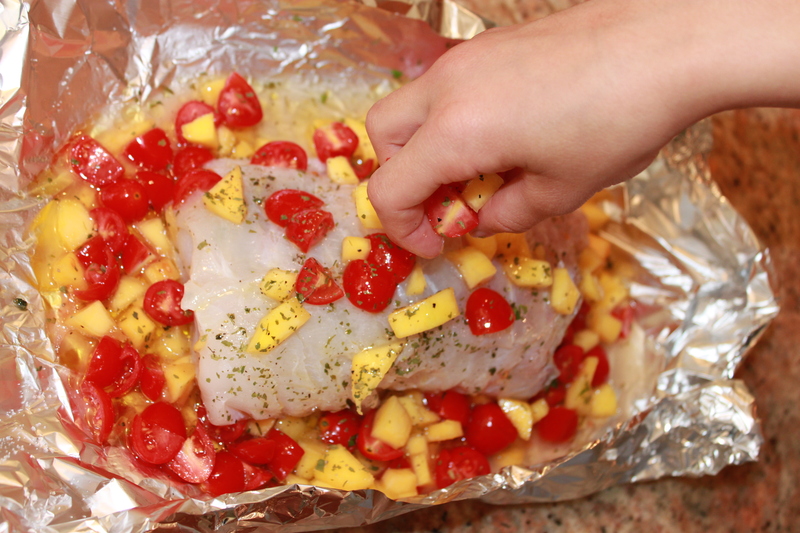 Help fold the ends of tin foil for fish and veggies. In Iran, crushed shallots are often eaten in yogurt. The body can digest the shallot much easier than it can an onion. 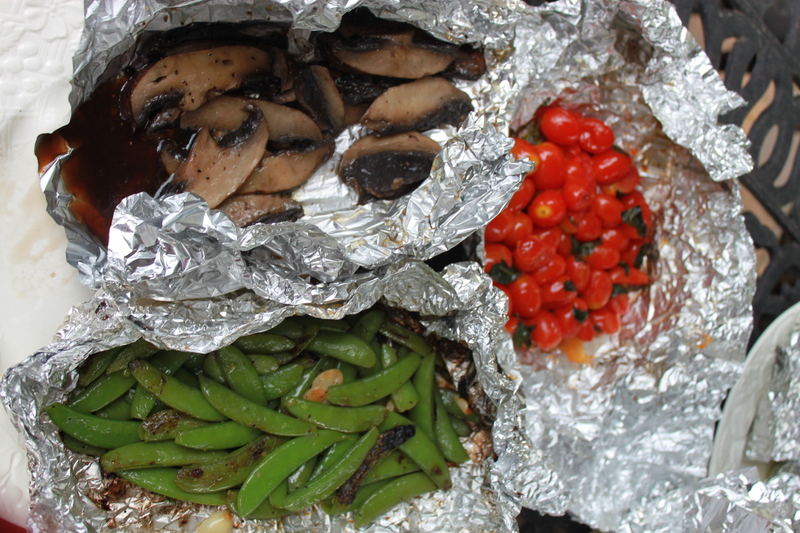 When I grill food on tin foil, it feels as liberating as serving dinner on paper plates. The kids like it because they don’t get too much of that charcoal taste and texture (yes, they don’t like the black stuff). I like it because I simply just throw it away after the food is cooked– no cleaning pots/pans or serving dishes. No matter what it is, veggies, steak, chicken, pork and fish – it all works on tin foil. And the best part is, you don’t have to worry about stuff falling through the cracks and you still get some grill marks and delicious grill taste. Now if it could only catch the things on my “to do” list from falling through the cracks…. 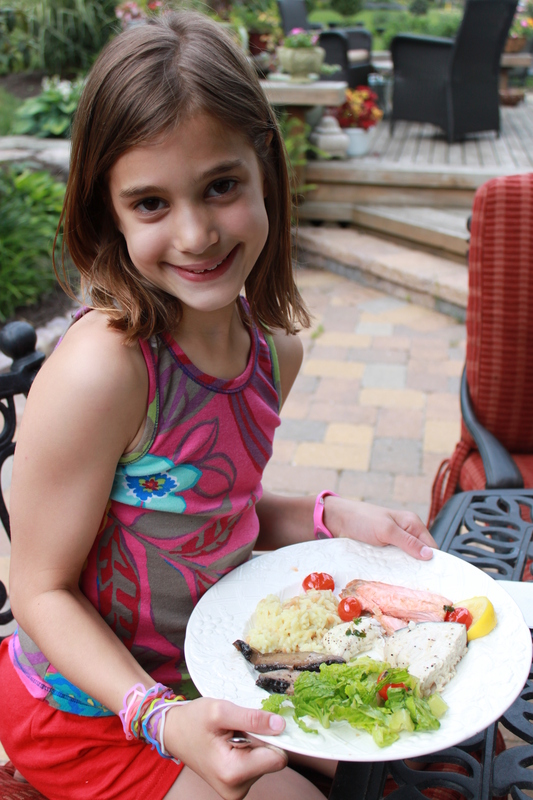 Grilled Fish: While not a fan of cooking multiple main courses, my kids and I picked 3 different fishes at the market today, “I want salmon, no I want swordfish, no I want…!”. The customer next to us said to me, “I have never seen children so excited about fish before!”. Put a piece of Salmon on tin foil and pour a little teriyaki sauce on top (and bottom), sprinkle with ginger powder, pepper and some fresh garlic cloves. Wrap in tin foil and grill for 7-8 minutes. 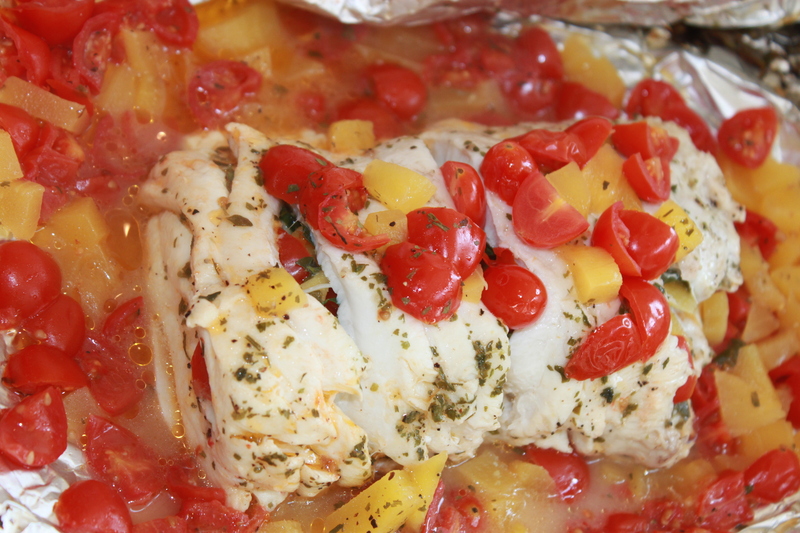 Cut a piece of swordfish in half and place on tin foil (with a little EVOO on bottom). 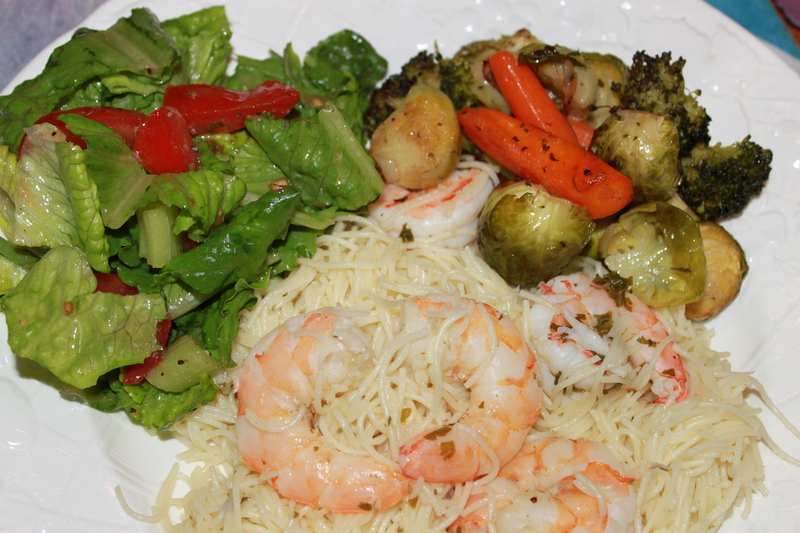 Pour a little EV Olive oil, fresh lemon juice, garlic clove and splash of white wine on top. 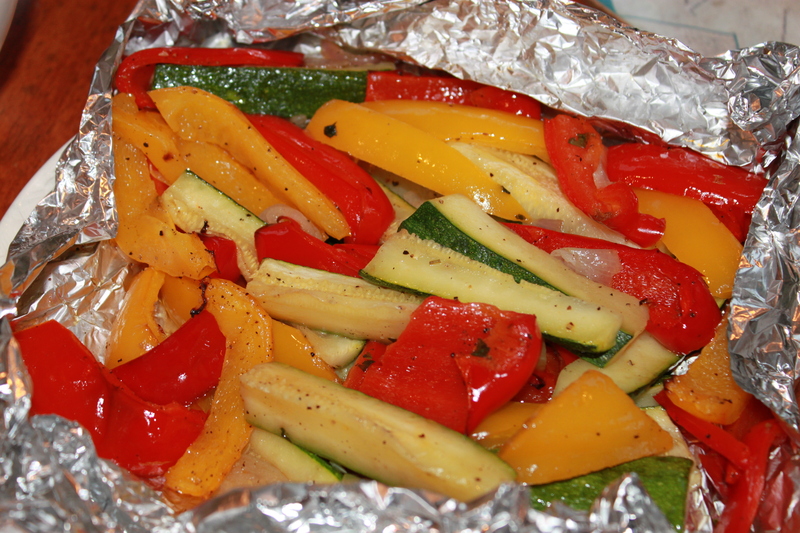 Wrap in tin foil and grill for 8-10 minutes. 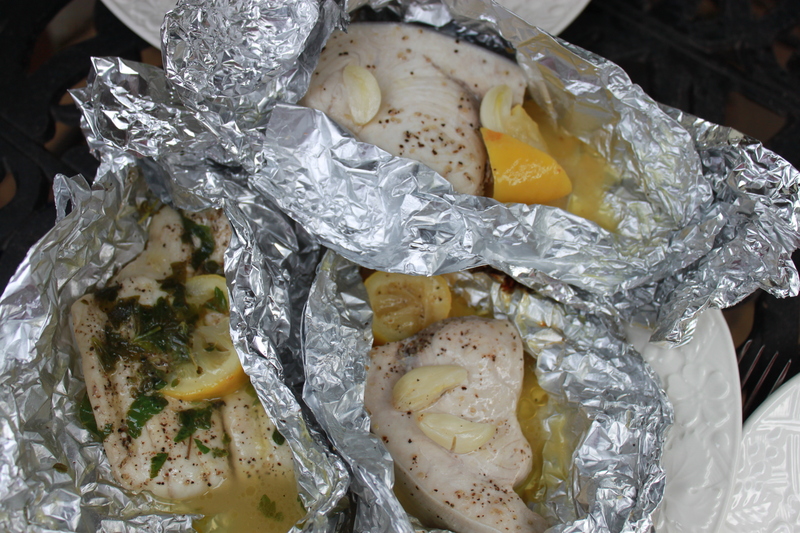 Place flounder on tin foil (fold thin sides under to cook evenly). Pour a little EV olive oil, salt/pepper, garlic clove, fresh lemon and spices (I used thyme and parsley). Wrap in tin foil and grill for 6-7 minutes. Place grape tomatoes on tin foil. Toss with EV olive oil, salt, pepper (and fresh basil if you have it. FYI it will turn black on grill). Wrap in tin foil and grill for about 10 mins. Wash and take strings off snow peas. Place on tin foil and toss with salt/pepper, fresh garlic and ginger powder. Slice mushrooms and place on tin foil. Toss with EV Olive oil, salt/pepper and grill for about 10 minutes. To get Omega 3 in eggs, farmers force hens to eat flaxseed (fish oil). Don’t bother, just eat fish instead. If Omega 3 is “added” to your food, chances are it wasn’t meant to be in there in the first place. Just eat fish! I went to my favorite fish guy in Ambler today determined to make grilled tuna (Mac has been bugging me to make it). When I arrived, it wasn’t as bright red as usual but I figured it would be fine. As I began to order it, I heard him whisper, “get something else”. So I quickly changed plans and ordered a big piece of the Cod. “Great choice!” he told me – as if it was my idea. It reminded me of a waiter that says something like, “are you SURE you don’t want to try the salmon instead?” – hint, hint, the veal is a real loser tonight. So I was thinking….wouldn’t it be great if someone could warn you before every meal what NOT to order, sort of a fairy godmother of food? Imagine if Stacey and Clinton from What NOT to Wear came jumping out of the restaurant’s kitchen to guide you in ordering the best items off the menu. C’mon tell me that wouldn’t be the coolest! I am not a girl that ever likes fruit in my dinner but when I bought this Mango and cut it up for the kids, Mia told me it tasted like lemon (which I forgot to buy for the fish). 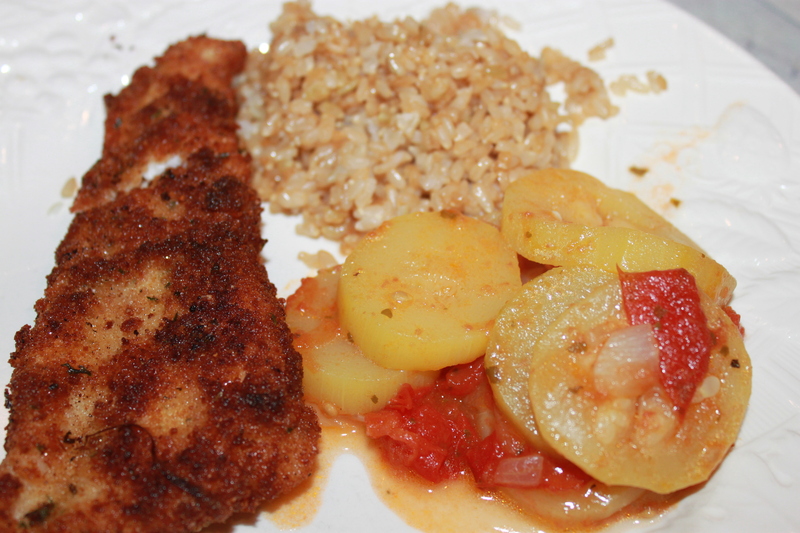 I asked her if I should put it on the fish and she suggested that I add some sliced grape tomatoes and Voila! Plus, once grilled it didn’t taste fruity at all. Pat your fish dry with paper towels and sprinkle with salt/pepper. Place on a piece of tin foil. Chop some fresh thyme, parsley and tarragon (from my herb pots – you can use dried too) and sprinkle it in on top of or inside the cod fish filet (if it is sliced). 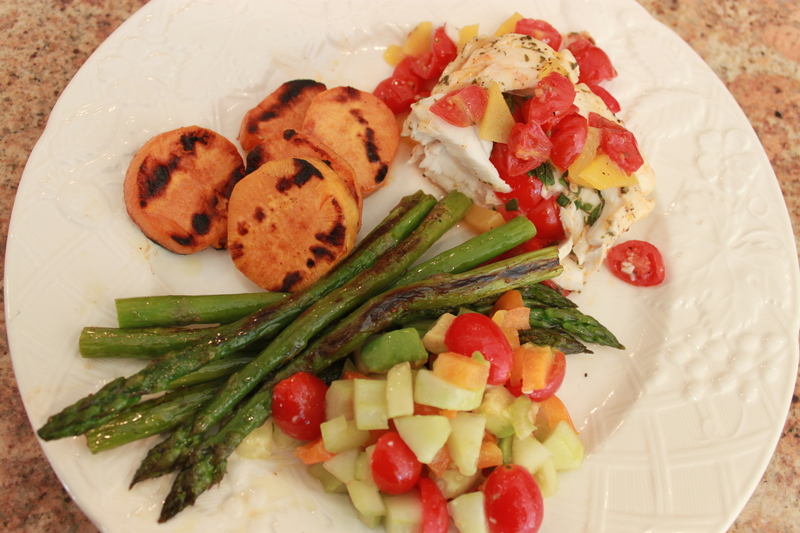 Dice a mango and some grape tomatoes and put on top of and all around the fish. Drizzle with some EV olive oil, white wine and lemon juice (bottled is ok). Place another piece of tin foil on top and tighten sides with bottom piece. Poke a couple holes for steam to escape. Grill on HIGH for about 10 minutes. Turn the heat down to Medium for another 5 mins. or so (depending on thickness of fish). 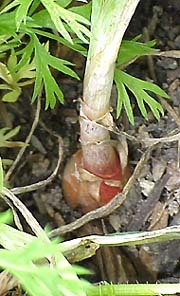 Snap the end off of one asparagus piece to see where you should cut the bottoms off the rest. 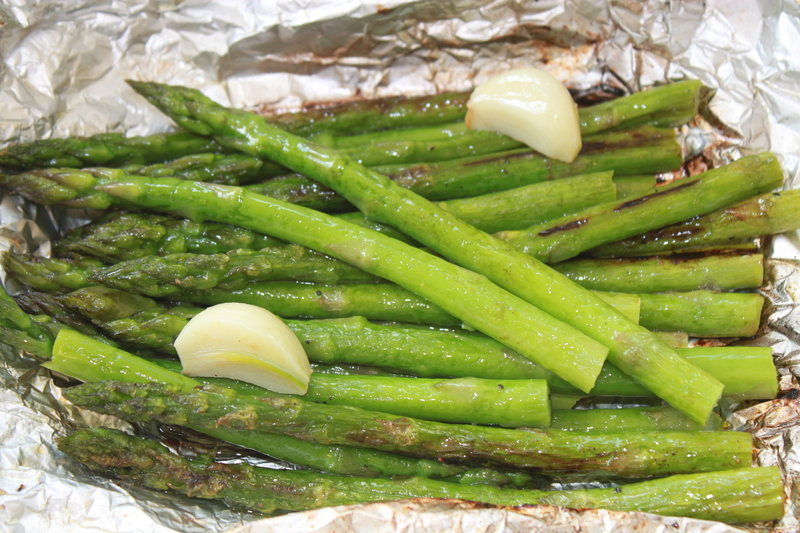 Lay asparagus on tin foil and toss (with hands) EV olive oil, salt/pepper, lemon juice and 2 cloves of garlic. Wrap in the tin foil and grill for 10 minutes on High. 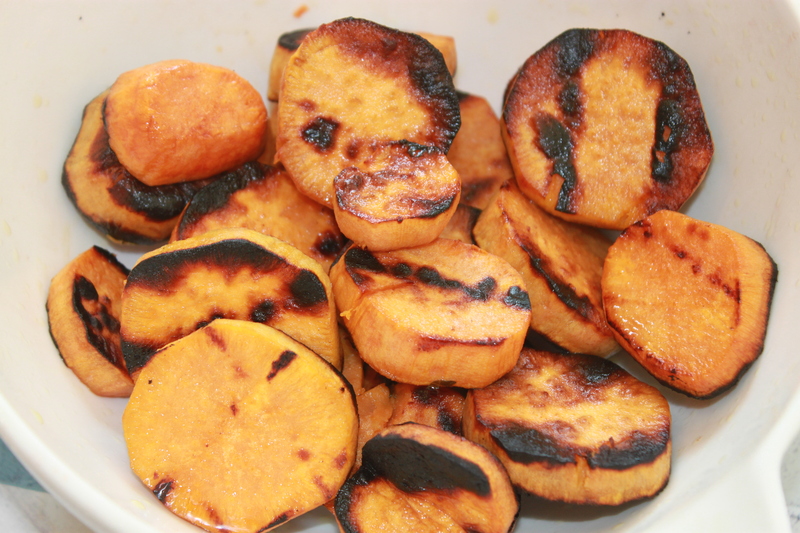 Peel and slice sweet potatoes (about ½ inch thick). Toss with EV olive oil, salt/pepper and a sprinkle of brown sugar. Lay on an open piece of tin foil and grill on High for 10 mins. and then Medium for 5 mins. (same as fish). Raw Salad: Raw salads are so good for you and so easy to make. Just cut up whatever you have! Peel and dice celery, orange pepper, cucumber, grape tomatoes and avocado. Toss with EV Olive oil, salt/pepper and Rice Wine Vinegar. Squirt some fresh or bottled lime juice on before mixing to ensure the avocados don’t brown. Plant a few herbs in a pot and let the kids help you pick them. 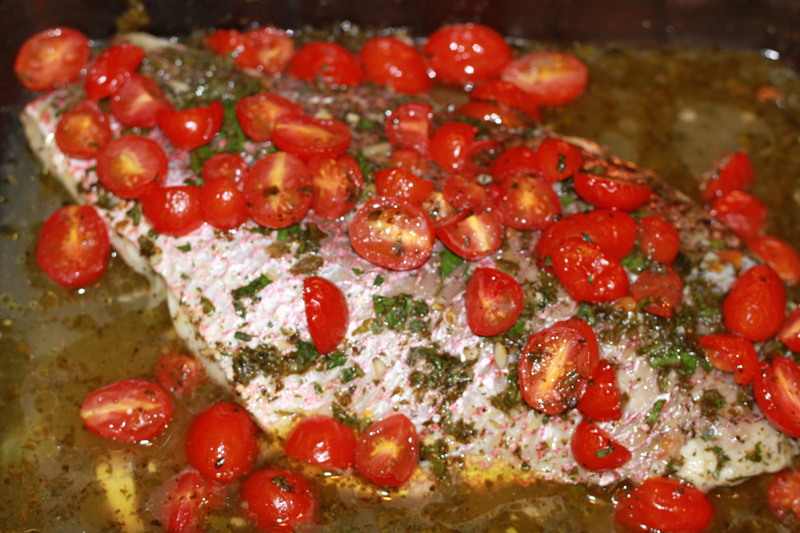 Sprinkle the chopped herbs and mangos/tomatoes in and around the fish. Toss asparagus with seasonings with hands! Help add ingredients and mix the raw salad. 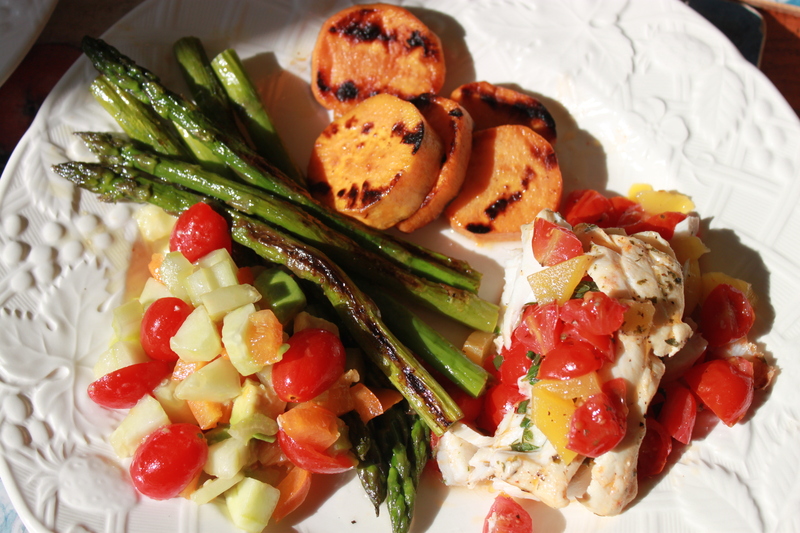 This dinner took 15 minutes to cook! I like grilling on tin foil because the kids don’t like things too charcoaled plus it makes for an easier grill clean-up and ensures that nothing falls through the cracks! 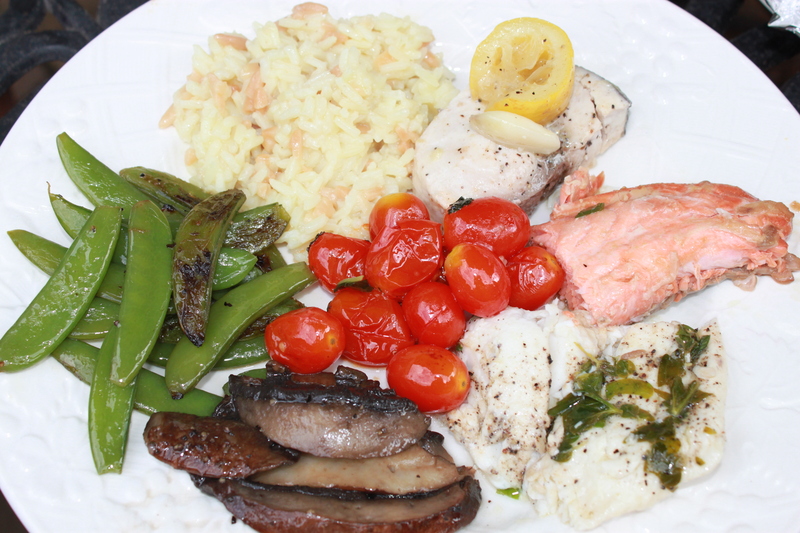 Cod is it one of the cleanest sources of protein with little or no carbohydrates or fat. Cod provides you with healthy doses of B12, B6 and Omega 3 fatty acids, plus it’s a very mild flavored fish – all good things for your heart, cholesterol levels, and fish has anti-inflammatory effects on the body and may help protect against skin cancer.